New Zealand's communists are devastated that their idols, the terrorist Tamil Tigers have finally been defeated by the Sri Lankan Army. 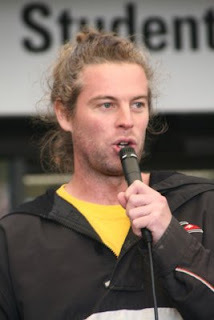 Auckland student and Socialist Aotearoa member Stu Colquhoun is fighting back. • To raise awareness of the urgency of the humanitarian crisis in Sri Lanka. o To contact their local MPs requesting the above demands are called for in Parliament. Go Stu-stick it out until ALL the demands are met. I can think of no nobler cause than starving oneself in support of suicide bombers and sadistic mass murderers. ... or the thousands of Tamil civilians who have been killed by indiscrimante shelling by the Sri Lankan Army. Also the thousands of Tamil civilians who have fled the warzone and are now being held in internment camps without access to enough food, medical care or water. Thought that might wind you up Cameron. Just a little question-who started the war? The British did. The structures the British imperialists created, which were inherited by Sri Lanka (at the time called Ceylon) made it inevitable there would be ethnic sectarianism and violence. I'm no great supporter of Sri Lanka's socialist government Cameron, but without doubt the LTTE (Tamil Tigers) were/are some of the most brutal marxist insurrectionists in the world. That you would still support these savages does you no credit. LTTE is not as brutal as the Sri Lankan government at the moment who is murdering civilians. Shame on you for trying to score cheap points on their misery.